A park with a lawn where you’ll find the residence that is home to 20 rooms of the hotel Marina 10. 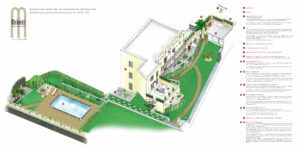 A convenient route in the planks of teak indicates the outdoor swimming pool. Between local stones wisely worked to give life to dry stone walls and flowers of aromatic plants such as rosemary, sage, lavender and capers are interspersed with jasmine, palm trees, grusoni, agave.